There is no cure for me, and if they found one, I wouldn’t take it. So, men, my task is to teach you how to be a hopeless romantic. And retain your manhood in the process. I don’t think it’s romantic simply to take the trash out without being asked, but if you’re not taking the trash out without being asked, this would be a good place to start! When was the last time you made the bed? Two minutes out of your life and you made your wife smile. The routine of marriage has a way of turning the early days of moonlight and roses to daylight and dishes. You can brighten her routine in little ways that may not seem romantic, but nothing says “I love you” like finding the bathroom cleaned. 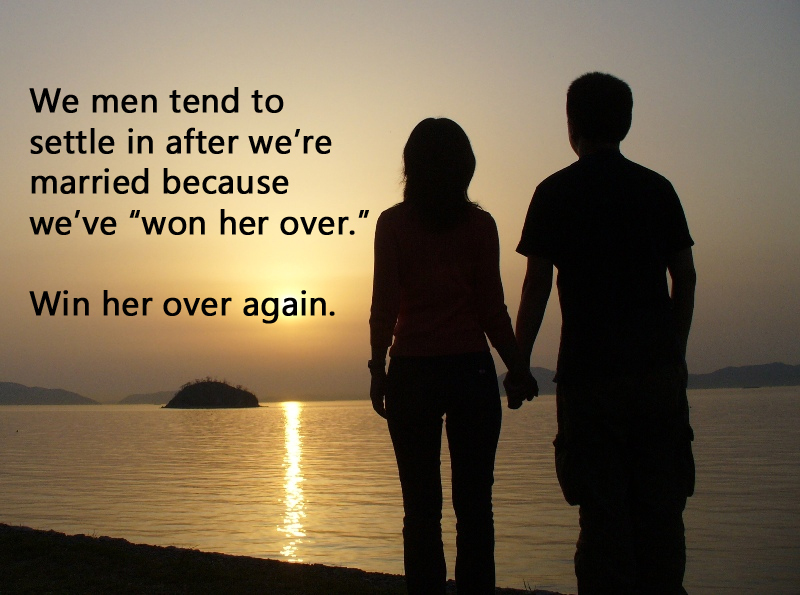 Win her over again. Take her on a date. Someplace without clowns and someplace where you don’t thrown away the plates when you leave. I took my wife to a casual lunch one week before our anniversary and handed her a gift. It was an outfit with the instructions to wear it on the plane trip the next day. Without her knowledge, I worked with her employer to keep her calendar free, and I booked travel to New England to spend our anniversary in a Maine bed and breakfast. Speaking of trips, take one. You don’t have to fly across the country, but plan something to break up her routine with kids, work, and picking up after you. My wife finds simple pleasure in a half-day Saturday road trip. It more than breaks the routine of the week; it gives us time to talk. Be both in romancing and dating your wife. The spontaneity comes in buying flowers while you’re running an errand to buy milk. Or cruise the card aisle and buy her one of those “just because” cards. It’s worth the planning. It’s worth giving up your macho image to be romantic. The return on your investment is incredible. Now go love on your wife and thank her handing you this article and telling you to read it. What the Women Folk Are Saying . . . This article originally appeared in HomeLife magazine, September 2009. Previous Previous post: Mulligans: Can I Do That Part Over Again?